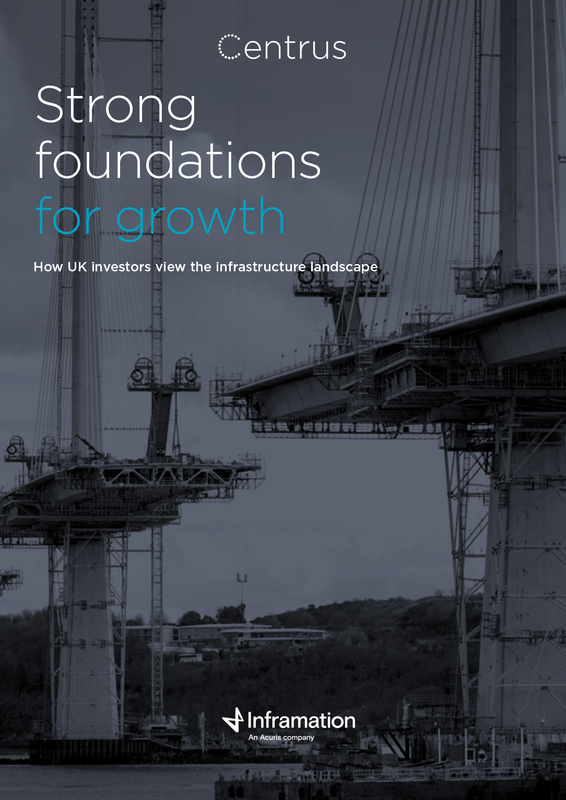 We are pleased to present Strong foundations for growth: How UK investors view the infrastructure landscape, published in association with Centrus Advisors and Inframation. The survey of 100 UK infrastructure investors reveals an asset class in rude health with investors upbeat but realistic about the future. They understand the benefits but acknowledge that, in the current uncertain climate, they need to expect and accept the unexpected. Infrastructure on a high. Demand for infrastructure investment is burgeoning. In 2016, global investment in greenfield and brownfield assets totalled £239.5bn – a year-on-year increase of 23%. Brownfield on the rise. H1 2017 saw 70 deals with UK equity investor involvement worth £14.3bn. This has already exceeded the value of brownfield deals for the whole of 2016. Greenfield blues. Greenfield deals accounted for only 22% of the total value committed by UK investors in H1 2017 compared to 59% for all of 2016. Hungry for power. 63% of survey respondents will increase activity in power, 55% will increase activity in transport and 35% will increase activity in social infrastructure in the next 12 to 24 months. Risk appetite. 43% plan to increase value added investments and 37% say they will increase opportunistic investments over the next one to two years. Investment drivers. Top drivers of investment in infrastructure are the expansion of the infrastructure landscape and increased appetite for private infrastructure funding. Emerging threats. The most significant challenges to investing in infrastructure are seen as regulatory changes/political risk (54%) and increased competition for assets (53%).